We already know that the simple act of reading can have considerable benefits, from improving your health and well-being to enlarging your capacities to empathy and strategic decision making. But I’ve noticed a pattern after asking this question hundreds of times over the years: A surprising number of the people I speak to don’t read just anything. They read—even obsess over—biographies and autobiographies. Former Air Jordan designer and founder of the groundbreaking Pensole shoe design academy (whom I profiled in Smartcuts) says he owes much of his unlikely rise from being a fatherless kid in Inglewood, California, to top Nike designer and entrepreneur to the inspiring biography of Jackie Robinson. Elon Musk, himself the subject of a recent best-selling biography, has spoken numerous times about his love for the biographies of great inventors and entrepreneurs in ages past, specifically those of Howard Hughes, Benjamin Franklin, Albert Einstein, and Nikola Tesla. By the time someone writes your biography, typically you’ve either really succeeded or really screwed up. Franklin’s autobiography is the most influential book in my own life. I’ve also returned repeatedly to several excellent biographies of Alexander Hamilton. These tend to be what I call “self-help in disguise,” because by the time someone writes your biography, typically you’ve either succeeded and overcome something, or really screwed up. I love stories of all kinds, but nothing motivates me more than real-life tales of ambitious people. And, it turns out, I’m not alone. We humans are drawn to human stories. Between showing us what’s possible and how past breakthroughs have happened, biographies can help us see how greatness thinks—in a way that textbooks often don’t. This is what initially struck me when I read Lewis Howes’s new book, The School of Greatness, which comes out this week. Based on Howes’s popular podcast, the book distills lessons from 200 interviews with Olympic gold medalists, celebrities, top entrepreneurs, and others. The book’s genius isn’t its format—interviews with cool people—but its approach: getting successful people to share how they think and live, not just how they work. You can be assured that someone has gone through worse. “The lessons in this book are not my lessons,” Howes writes in his introduction. “They are my lecture notes from a unique and wonderful school.” Of course, Howes isn’t the first to use biography as a method to “hack” education. For all their fame, school dropout stories like those of Bill Gates and Mark Zuckerberg tend to obscure the fact that the most successful people keep educating themselves even after some of them bypass formal institutions–especially through reading. Gates’s public reading list is stacked with biographies of innovators before and after him. “Our capacity for success and greatness is embodied by the people we surround ourselves with,” says Howes. If we can’t hang out with Franklin and Einstein and Tesla, why not surround ourselves with their stories? Shane Snow is a journalist in New York City and cofounder of Contently. 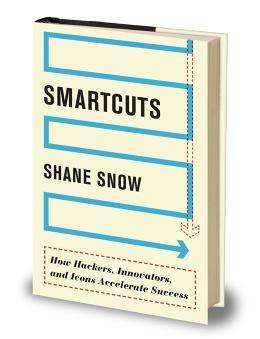 Get a free chapter of his bestselling book, Smartcuts, here.